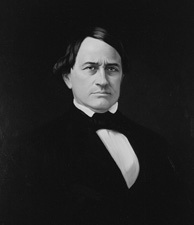 Because of his war service, the governor of Mississippi appointed Davis to fill out the Senate term of the late Jesse Speight. He took his seat December 5, 1847, and was elected to serve the remainder of his term in January 1848. In addition, the Smithsonian Institution appointed him a regent at the end of December 1847. In 1846 he resigned his seat in order to serve in the Mexican War and fought at Monterrey and Buena Vista, where he was wounded. He was U.S. senator from Mississippi from 1847 to 1851, secretary of war in the cabinet of President Franklin Pierce from 1853 to 1857, and again U.S. senator from 1857 to 1861. As a senator he often stated his support of slavery and of states' rights, and as a cabinet member he influenced Pierce to sign the Kansas-Nebraska Act, which favored the South and increased the bitterness of the struggle over slavery. In his second term as senator he became the acknowledged spokesman for the Southern point of view. He opposed the idea of secession from the Union, however, as a means of maintaining the principles of the South. Even after the first steps toward secession had been taken, he tried to keep the Southern states in the Union, although not at the expense of their principles. When the state of Mississippi seceded, he withdrew from the Senate.